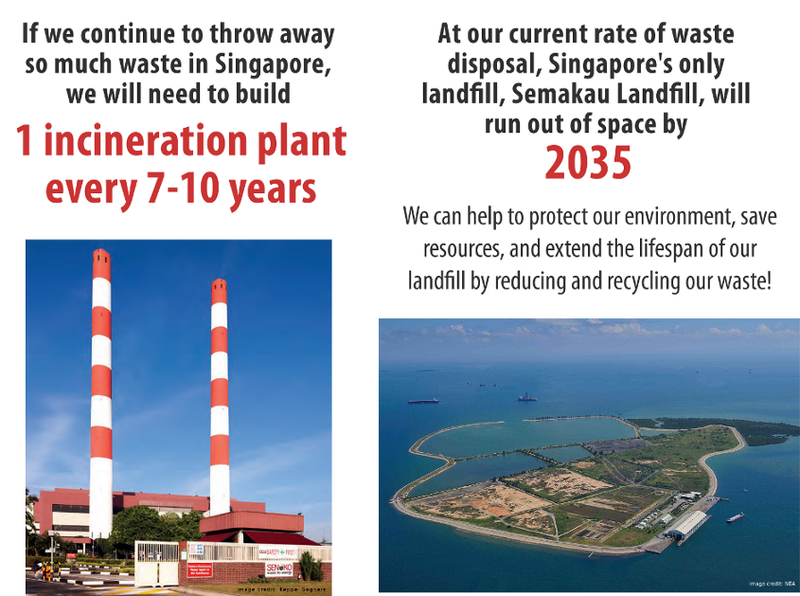 Let’s Recycle Together is a new campaign by Zero Waste SG. We aim to encourage more HDB residents to recycle using the existing blue recycling bins in their estates, and to educate them on recycling correctly. 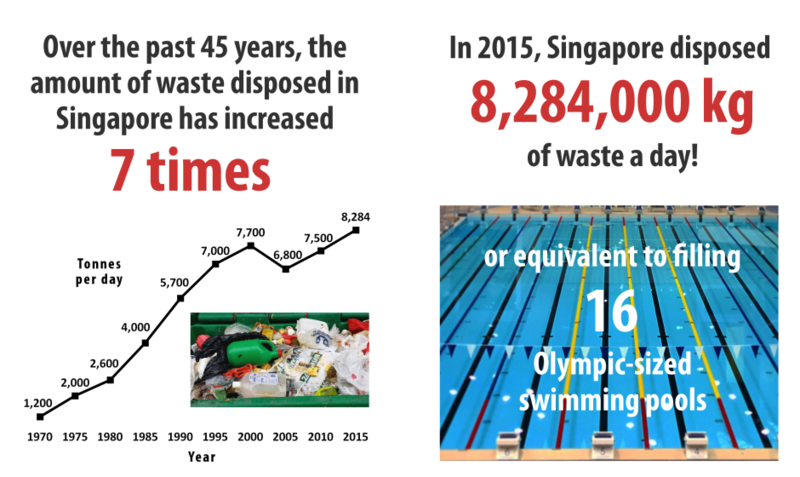 This ground-up campaign complements the National Recycling Programme by the National Environment Agency (NEA), where the Public Waste Collectors licensed by NEA are required to provide the blue recycling bins and recycling collection for all HDB estates and landed properties in Singapore. Your neighbours and other families are recycling, join them today and let’s recycle together! 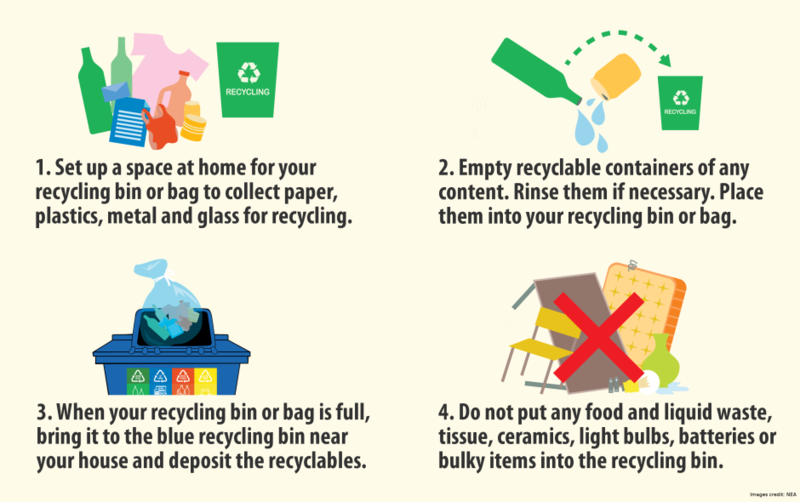 Some residents place a recycling bin in their house,while others use a plastic bag or reusable bag for storing their recyclables, it’s up to you! The National Recycling Programme uses a commingled collection system where all the recyclables go into a single blue recycling bin. According to NEA, the commingled system is convenient for residents as they do not need to sort or make space in their homes to store different recyclables. It also allows for a single-stream collection of recyclables, which is a cost-effective method. The collection from the recycling bins is done daily or 3 times a week, depending on the sector. You can check the locations of the blue recycling bins at the housing estates in Singapore from the SLA OneMap, and find out more about the Public Waste Collectors and their collection days from NEA. Check out the list below to learn what items can or cannot be placed into the blue recycling bins at HDB estates! We have checked this list with NEA to ensure it’s correct. 8. Envelope With or without plastic window included. 9. Flyer Glossy and non-glossy included. 12. Juice carton Should be emptied. Please rinse if necessary and flatten if possible. 13. Magazine Glossy and non-glossy included. 14. Milk carton Should be emptied. Please rinse if necessary and flatten if possible. 23. Tissue box Please flatten if possible. 1. Beverage bottle Should be emptied. Please rinse if necessary. 1. Takeaway food containers (styrofoam or PS plastics) Check the triangle plastic code usually printed on the container - 6 for PS. 2. Bodywash and shampoo bottles Should be emptied. Please rinse if necessary. 2. Disposable cups (only for styrofoam or PS plastics) Check the triangle plastic code usually printed on the cup - 6 for PS. 9. Plastic bag Should be clean and emptied. 10. Plastic containers, trays and tubs for food (non-polystyrene) Should be emptied. Please rinse if necessary. 11. Toiletries containers Should be emptied. Please rinse if necessary. 2. Aluminium trays and foil Should be clean. 3. Biscuit, milk and food tins Should be emptied. Please rinse if necessary. 4. Drink cans Should be emptied. Please rinse if necessary. 5. Food cans Should be emptied. Please rinse if necessary. 6. Paint cans Should be empty and dry. 2. Cosmetic bottles Should be emptied. Please rinse if necessary. 2. Light bulbs Recycle fluorescent lamps and light bulbs via lamp recycling bins. 5. Medicine and supplement bottles Should be emptied. Please rinse if necessary. 6. Sauce and condiment bottles Should be emptied. Please rinse if necessary. 1. Old clothes (in good condition) Donate to charity or give it away if possible. 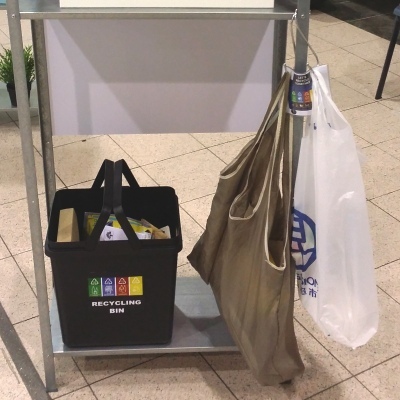 Bag before depositing into the recycling bin. 1. Bags Donate to charity or give it away. 3. Electrical and electronic items Recycle using e-waste recycling bins. 5. Furniture Donate to charity or ask town council cleaners to remove. 6. Household batteries Singapore has imposed restrictions on the mercury content in mercury oxide, zinc carbon and alkaline batteries, so used household batteries can be safely discarded with normal waste - NEA. 9. Plants and horticultural waste Garden waste is only collected from landed properties and not HDB estates under the National Recycling Programme. 10. Rechargeable batteries Recycle using e-waste recycling bins. 12. Soft toy Donate to charity or give it away. 13. Spectacles Donate to charity. The recycling trucks only collect recyclables from the blue recycling bins and do not collect waste from the rubbish bin centres. 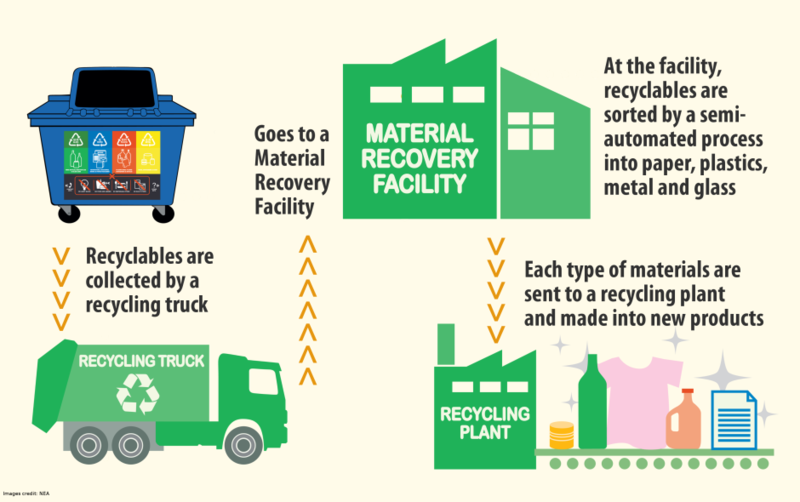 The type of trucks used for collecting recyclables and waste might look similar but they are actually separate trucks with different collection schedules. The recycling trucks would usually have a recycling logo on the side of the truck. Here’s some photos of a Material Recovery Facility operated by one of the Public Waste Collectors. The recyclables are collected by the trucks and sent to the facility, where the recyclables are placed on a conveyor belt and the workers sort them according to material types. The sorted materials are either exported overseas for recycling or sent to local recycling facilities. Some of the local recycling facilities are listed in the NEA website. You can also learn more about the recycling process of these materials: Paper; Plastics; Metal; Glass; Food Waste; Wood and Horticultural Waste; Electrical and Electronic Waste; Tyres; and Construction and Demolition Waste.